A very large vehicle accident involving 50 cars and trucks on I-75 in Ohio. Leaving 20 people hurt in multiple vehicle crashes on Monday, January 21, 2013, according to report by WCPO officials in Ohio. A driver posted on Facebook earlier and said, "We've been stopped on I-75 South since noon. We are about 150 yards behind the accident. For those criticizing people driving in the snow, this was a freak situation. Conditions went from dry and light flurries, to blizzard-like conditions (very low visibility, slick, etc.) in seconds. I had seconds to adjust and slide. We missed the pile up by 10 seconds." According to Inquisitr site report. Highway patrol officials said that there are 18-20 people who got a minor injury treatment. Luckily, there were no deaths associated with the 1-75 pileup. 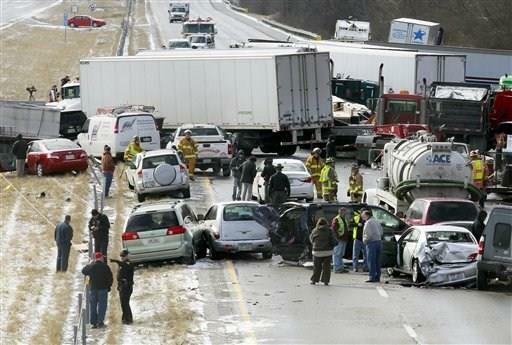 Some news agency said that the crash was likely caused by the “white out” conditions in Ohio. Comments or suggestions about "50-vehicle Crash on I-75 in Ohio" is important to us, you may share it by using the comment box below.